The Vikings didn't make it easy, but were fueled by the legs of Adrian Peterson as they powered themselves to a 20-10 win over the Falcons. Daniel House provides his post-game notebook. The Vikings didn't make it easy, but were fueled by the legs of Adrian Peterson as they powered themselves to a 20-10 win over the Falcons. On the Vikings second drive of the game, they perfectly executed a drive that blended the pass and run perfectly. The 13-play drive was capped by a 1-yard touchdown from Adrian Peterson. On the next possession, Tevin Coleman was stripped by Anthony Barr, but Teddy Bridgewater threw a red zone interception on the next drive. The Falcons added a field goal and Blair Walsh missed from 51 yards out to end the half. 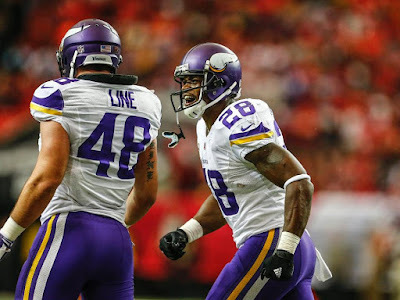 Coming out of the break, a Captain Munnerlyn interception in the red zone resulted in a Vikings field goal as they extended their lead to 10-3. After an Atlanta three-and-out, Minnesota added another field goal and led 13-3 with 6:24 left. An Anthony Barr sack on fourth down resulted in a Falcons turnover-on-downs and a 35-yard touchdown by Adrian Peterson that put the game on ice. Atlanta added a late touchdown, but Minnesota held on for a 20-10 win on the road. The Vikings have won four consecutive road games for the first time since 1998 and reclaimed a one-game lead in the NFC North. The Vikings were powered by Adrian Peterson and a solid defensive performance once again. Adrian Peterson continues to cement the fact that he is one of the greatest players to ever wear a uniform in the NFL. Today, he single-handedly powered the Vikings offense past the Falcons. Entering the game, Atlanta was the top rushing defense in the league. Peterson made them look like one of the worst. He carried the ball 29 times for 158 yards and two touchdowns. Not to mention, he added two catches for 29 yards through the air. His 35-yard touchdown in the 4th quarter powered the Vikings to a 20-10 victory. The ability for Peterson to run the ball well helped Minnesota run clock at the end of the game. When the offense struggled to find identity in the passing game, the rushing attack picked up the slack. Peterson's ability to break tackles and make plays in space were phenomenal. Much of this rushing success came with yards after contact. He simply wasn't going to be denied in this ball game. Anthony Barr took over this game on the defensive side of the ball. Early in the contest, he hustled to knock the ball out of Falcons running back Tevin Coleman's hands as he was running towards the end zone. During a fourth-and-short situation later in the game, Barr sacked Matt Ryan and gave the Vikings momentum. Barr had eight total tackles, a sack, and a forced fumble in this contest. Barr's ability to make tough plays in space was the difference today. He perfectly covered a wheel route to Coleman and knocked the ball down in front of the sideline. There wasn't a play Barr didn't make on the field. With Harrison Smith out, Anthony Barr handled the role of being an enforcer on this defense. Even as time of possession was wearing on the Vikings defense, they still managed to stand strong and make the plays necessary to win. Anthony Barr was the type of defensive force the Vikings want him to be within this system. As I discussed in my preview of this game, the Falcons have been killing themselves as they've turned the ball over frequently in the last three contests. They followed much of the same script today. Matt Ryan made a terrible throw in the red zone and Terence Newman hauled in the interception. In addition to that, Ryan couldn't find his receiver across the middle and Captain Munnerlyn snatched it in for an interception. Ryan continually is making poor decisions and it cost the Falcons again. Finally, Tevin Coleman fumbled on a 46-yard run as he was breaking towards the end zone. Anthony Barr poked it away and shifted early momentum in the Vikings direction. The Vikings defense continually made plays and it helped them overcome their offensive deficiencies. Winning the turnover battle was big in a road game like this and the Vikings did that with ease. Over the last two weeks, Kyle Rudolph has been heavily involved in the offense. Today, he hauled in a career-high seven receptions and led the team with 53 receiving yards. He made some excellent plays after the catch and was a safety valve near the chains. The pocket was protected much better today and Bridgewater had time to make decisions. However, passing wasn't in the game plan. When the ball was moved through the air, it was via short throws. This is something that needs to continue. Nonetheless, they will eventually need to move the ball vertically and they haven't been able to do that. The receivers had trouble getting open today, but some illegal contact, holding, and pass interference calls were critical to sustaining some drives for the Vikings. Moving forward, the receivers need to get separation in the secondary. Passing wasn't needed today, but it will be in the future. Bridgewater had just 174 yards passing and under threw a pass that was intercepted and intended for Kyle Rudolph in the end zone. The passing game needs to find a rhythm because eventually teams that can stop the run will force the Vikings to move the ball through the air to win. The Vikings had to overcome injuries to persevere in this contest. Harrison Smith missed the game with a knee injury and Antone Exum made the start at safety. At a quick glance, he didn't seem perfect, but had three tackles, including one for loss. Not to mention, early in the game, Andrew Sendejo went down with a knee injury. Robert Blanton was playing alongside Exum for the majority of the game. They didn't allow any big plays and Blanton led the team with nine total tackles. The defense played team football and didn't allow a couple injuries to keep them from winning this game. Everson Griffen played through injury and had a massive sack late in the game that gave the Vikings the ball back. This defense has plenty of heart and drive to win each week -- they've been the difference this season. Thanks for reading and supporting me! Hope everything is going well in Florida!